A big commitment. Part 2. It was a very delicate and difficult situation for us all, Geordi was so very special, but it turns out that they were feeling the same way as me, that he had left a huge void in our lives. I showed them my findings and that made them feel even better about a new puppy. Entlebuchers are the exact opposite of Geordi in every way: he was small and white, they’re a lot bigger and black; Geordi was a go to the beach, sunbathe and hit on hot chicks kind of a guy, whereas Entlebuchers are more likely to want to learn to surf and go for a swim. When Geords went for a walk in the woods he inevitably ended up being carried half way because he liked the scenery but got tired, but an Entlebucher would probably even be able to keep up with my mummies if they went there on their bikes! In essence, Geordi was his own man; he had his way of doing things, and he knew that he was their baby, not their dog. 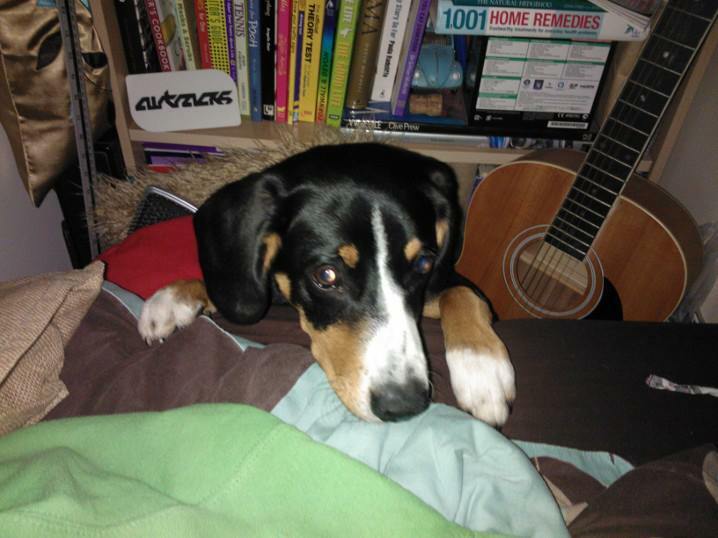 We all decided that an Entlebucher would definitely be more of a ‘dog’ dog. This is where Mummy J being bilingual comes in handy; there is an abundance of info about Entlebuchers written in German, so she could fill in the gaps in mine and Mummy El’s research. 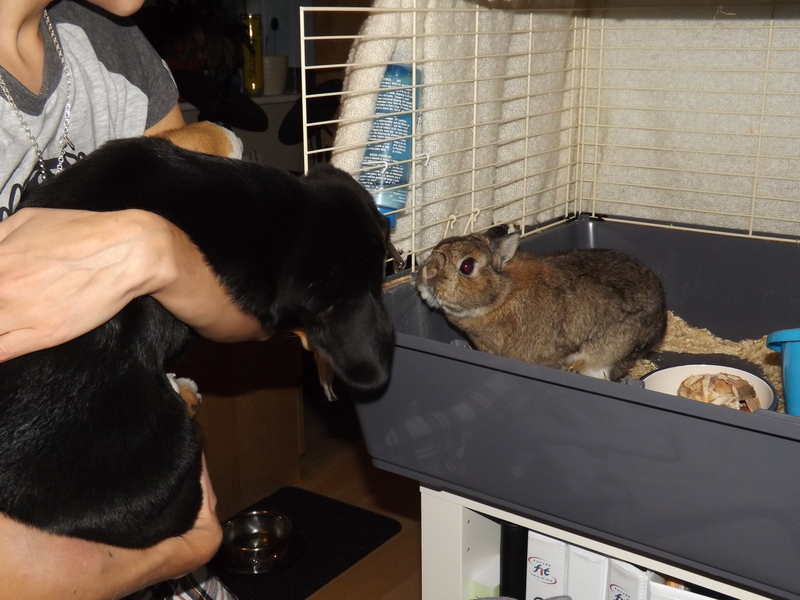 It didn’t take us all long to decide that this was the dog for us, but just to be doubly sure that I’d be okay Mummy J joined a forum and found a good handful of German speaking people who had Entlebuchers and rabbits in the same household, and they all said it was fine. 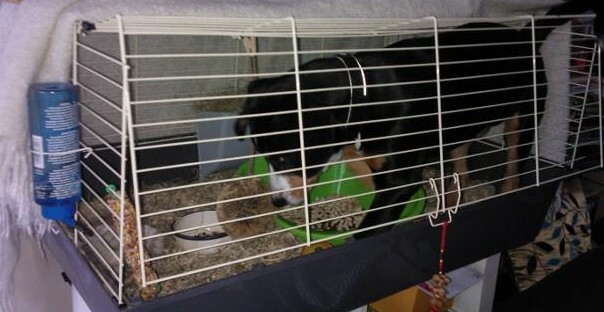 I’ve got an online Entlebucher buddy now called Alfie who lives up north, and he’s friends with his neighbour’s chickens so I think I’ll be all right. To be honest, I’d feel a bit better about life if I had a big strong boy to look out for me again. Geordi may have looked like a powder puff on legs but he wouldn’t have let that Spaniel from next door chase me like he did… I don’t even want to think about it. This puppy can’t come fast enough! My mummies have explained that I’m still going to be their number 1 priority – and rightly so – and we’ve got to introduce the puppy to me slowly, but I think he’ll be fine. I’m working on my growl, and I’m not backwards at coming forwards when I don’t like something, so I’ll be quick to put him in his place. I’m the man of the house now, and I’m not giving that up for anybody. 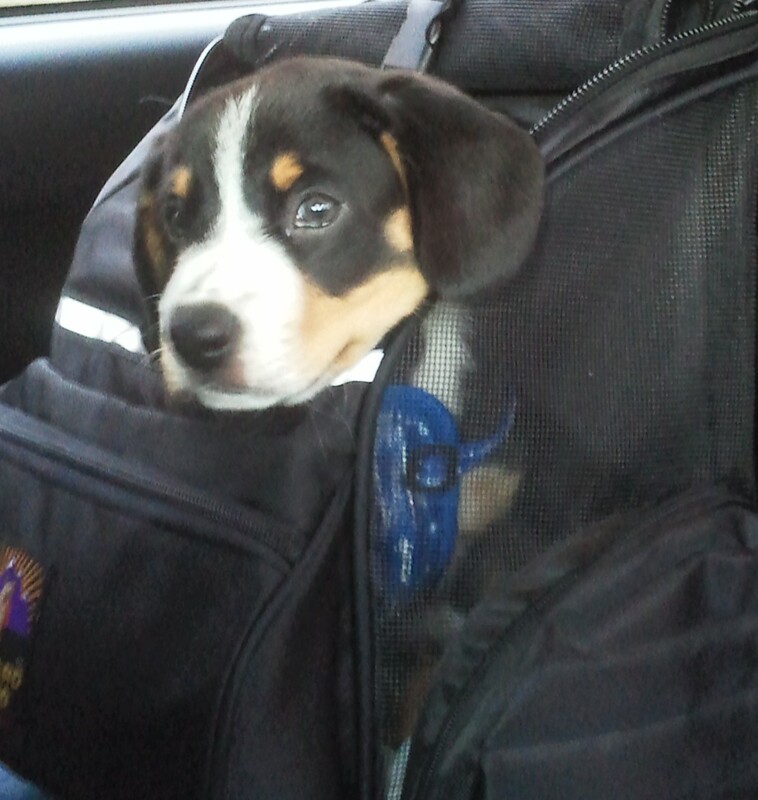 Come back tomorrow to read about my first meeting with an Entlebucher. 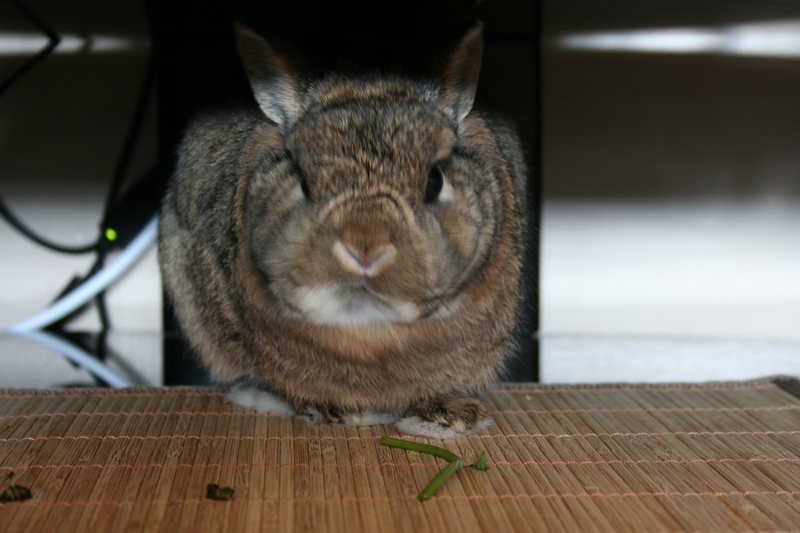 This post was dedicated to Geordi Boy, the best friend a bunny could have. A big commitment. Part 1. Our weird and wonderful family is getting bigger! We’re adding a bit of Swiss into the mix. This isn’t really news to me, I’ve known for a while and, in fact, it was my (brilliant) idea, but I’m getting more and more excited about it, so wanted to share the news with you, my new friends. The story starts on a sad note. You see, I haven’t always been the man of the house; when I arrived I had a big bro. I know technically Frodo is my big bro, but I mean I had a BIG bro – well, compared to me anyway. 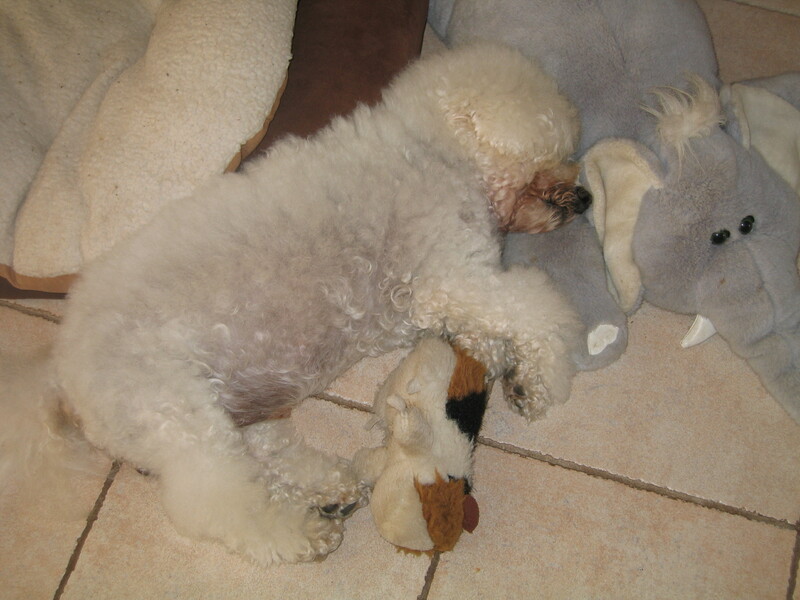 His name was Geordi and he was a Bichon Frise. I was a bit unsure of him at first, he was so brave and confident, and I was just a baby, but he soon convinced me that he just wanted to be a good role model, show me how to wrap the grown-ups around our paws, and how to give them the signals for “I’m hungry”, “I’m bored” and “I don’t care if it’s Sunday, get up!”. He was my mentor, my playmate and my best friend, but all too soon I lost him to the big kennel in the sky. Now, nobody could ever replace my Geordi, he was one of a kind, but I have been getting a bit bored and lonely, and I feel like I would be a good big bro. I think Geordi would be proud to watch me pass on all of the secrets of mayhem to a new puppy, the same way he passed them onto me. 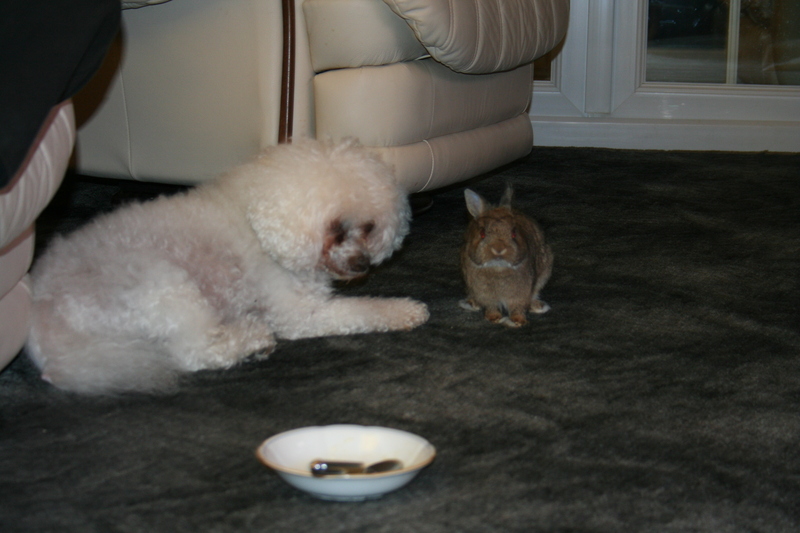 Now, as the Spaniel next door proved to me in an unfortunate chance meeting, getting the right dog to live harmoniously with a rabbit is a tricky process. I took to the internet and started doing my research, trying to cross reference my needs with those of my mummies. See, they’re very outdoorsy, active people (when Mummy El can walk!) and love doing things that I just can’t join in with. 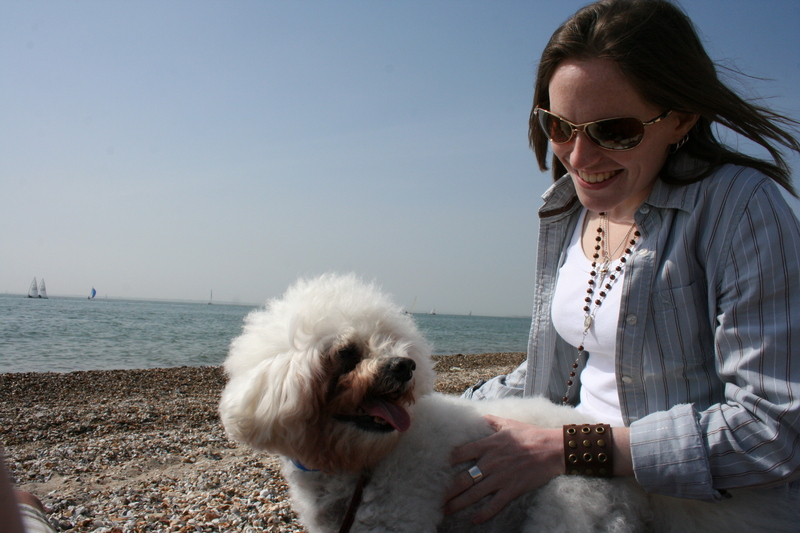 I grant you, Geords wasn’t the most sporty or athletic little dog but he was always chuffed to go with them to the beach and for a walk in the woods, and I got the feeling they were missing that. I quickly dismissed some of the smaller, toy breeds as they didn’t seem a good fit for my parents, and I certainly didn’t want to risk a terrier! My self-preservation alarm went off straight away! Anyway, one day, by pure chance I came across a really handsome dog called an Entlebucher. It was the smallest member of the Swiss Mountain Dog family, but I’d never heard of them before so had to do a bit of reading (not that there was much information out there) and imagine my joy and surprise when I read that they have little or no hunting instinct! Plus, they’re like the Olympians of the dog world, which I knew would please my mummies, so I decided to broach the subject. Come back tomorrow to find out how.